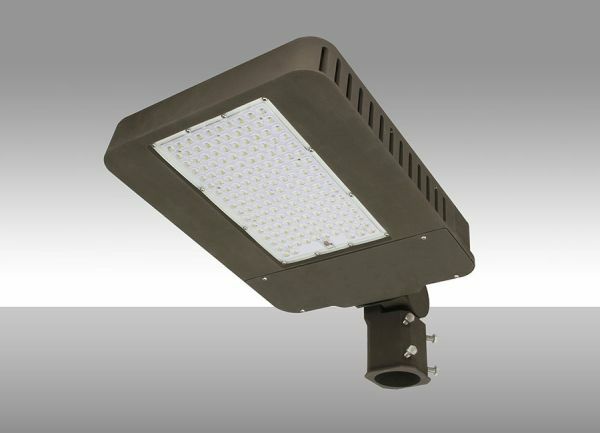 Providing a sleek and efficient alternative to traditional shoebox fixtures, MaxLite introduces LED Slim Area Lights as well designed illumination for roadways, parking areas and pedestrian routes. The luminaires deliver high performance in a low profile design that can be effortlessly applied to new and retrofit outdoor projects. Available in outputs ranging from 7,000 to 30,000 lumens, the series replaces high-pressure sodium fixtures of up to 750 watts using 70 percent less energy. MaxLite Slim Area Lights in 60-, 100- and 140-watt inputs are DesignLights Consortium (DLC) Premium listed and qualify for the highest levels of utility rebates across the country. The 280-watt model is DLC Standard listed and also eligible for rebate incentives. The series is available in Type III and Type V optics that distribute efficient and uniform light. MaxLite offers the line in 5000K and 4000K color temperatures. The Slim Area Light comes with a universal 120-277V dimming driver as standard; compatibility with 347-480V systems is also available. The luminaire can be combined with photocontrol and motion sensing options to maximize energy savings and further enhance safety and security for motorists and pedestrians. All models have a 100,000-hour lifespan based on L70 standards and come supported by MaxLite’s industry-leading 10-year warranty, which covers parts and labor. The Slim Area Light is available in straight, knuckle and trunnion mounting options.